I use the 3.3v and GND pins next to the SPI pins so, again, can just use a 6x2 header. Great thanks- could you clarify exactly which header pins and which RFM pins need to be connected? I’m considering having a play with some bare metal coding if I get a few minutes spare. You can use CE0 (second down on left) rather than CE1 if you want and can use any other GPIO than 22 (#defined in code). interesting project - i’m looking using an RFM22b to communicate with FS20/FHT protocol. could you confirm that you are using RFM22b (and not RFM12) ? Oops. Typo. As you say, should be RFM12B. 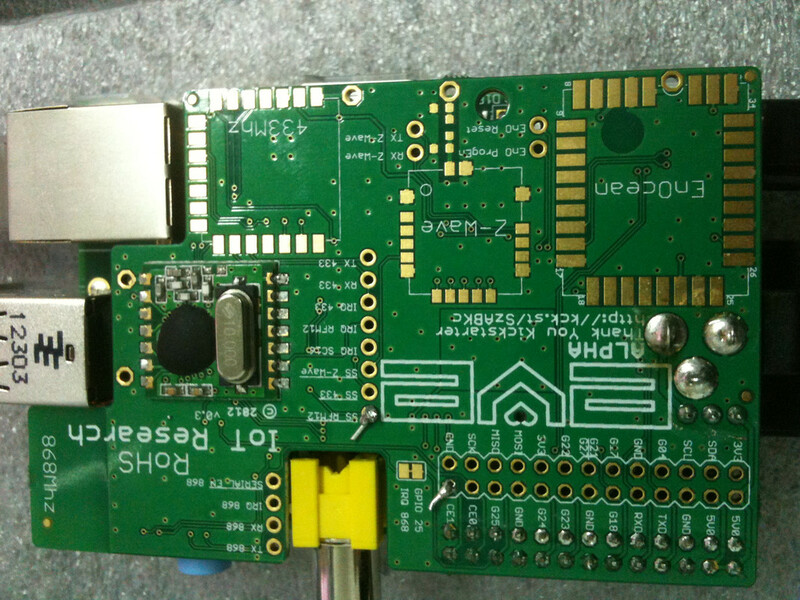 Anyone can use this in a raspberry pi with an alpha eve board with rfm12b radio? I have one but haven’t tried doing anything with it yet. I try but without any result! I see that exist a driver for the srf radio, that transform it as a serial port under /dev/ it would be great that exist to rfm12b too. To rfm12b i only find some code examples for arduino and nothing for raspberry. Yep… the last post is mine. I have also an EveBoard didn’t try anything yet but happy to help! Will try and find a little more time to play- keep me posted. I solder the jumper and the resistor, after i try two jumper and no resitors but never can see the rfm enable i only see the clock and the temperature sensor. ltickett how do you connect rfm12b? like the second/third image (with a resistor- although it is suggested that it shouldn’t matter). is your eve alpha board definitely powered? and are all your joints definitely good? Do you power the alpha board too? If i soldered only the first jumper wire should be ok? Yes- i’m powering my EVE from the Pi (no external psu). Do you have a multimeter so you can test the rfm12b pins? Where should i put the multimeter to debug? Do you have a USB logic debugger? That will help to debug the comms. The RFM12B won’t show up in an i2c list, as it’s an SPI device not i2c.